Ask fellow campers about "The Blanco Settlement" and nearby attractions. Owners/Managers are friendly and helpful with local information. RV camping was very clean, quiet and quaint. There is a great gift shop and cute individual cabins looking over the river. 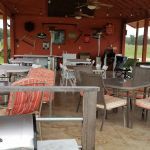 They had fire pits, party group facility, cabins and close access to the beautiful Blanco River. 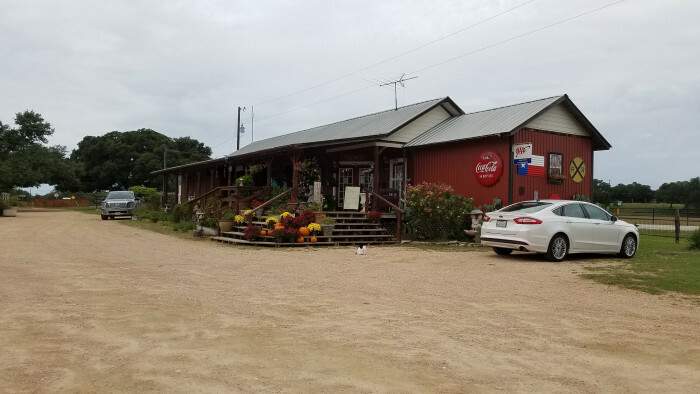 We are recumbent trike cyclists and found beautiful Texas Hill Country quiet and safe farm roads to cycle just north of Blanco (Fm Rd 106, 108, 109, 110...) We will return for additional visits! 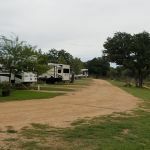 We camped at The Blanco Settlement in a Travel Trailer. We stayed a month and will be back. Staff friendly and helpful. Right on the blanco river. Nice level sites, a little close but not too bad. 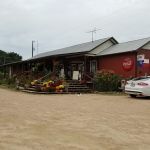 Central local to Fredericksburg, marble falls, Austin, San Antonio and blanco have lots of little shops. We camped at The Blanco Settlement in a Fifth Wheel. Like others have said this is a small park with some cute cabins on the river. The front desk staff was wonderful, however, the park host was not as welcoming. We were only there for a couple of days, but he was rather rude just upon arrival. That would never keep us from staying at a park, though. As long as it's well kept and comfortable were good with that. So, With that being said here's the pro's and con's Pro's are it's on a nice clear river and it is a small park. Con would be the sites are so close together we walked outside our front door to a septic hose pretty close to our stairs. We camped at The Blanco Settlement in a Fifth Wheel. We stayed at Blanco Settlement for a few weeks. 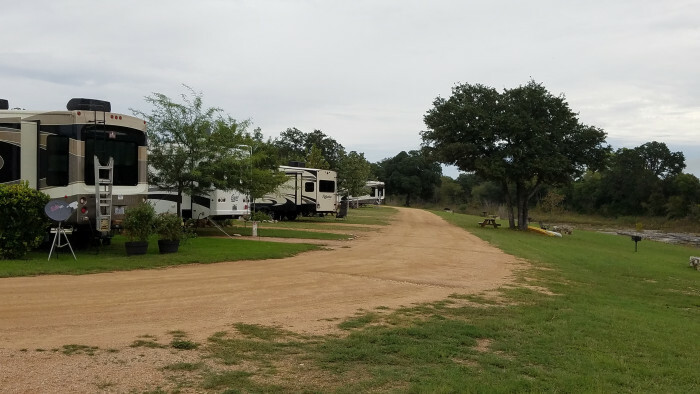 This is a cute little RV park right on the Blanco River. The pros - we loved that it was a smaller RV park with 20 sites. 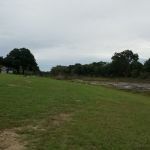 It is right on the Blanco River and we enjoyed taking the kids to the river to play. The staff and the full-timers staying there were very friendly. We loved the gift shop and made several trips to shop. There are also cottages to rent that were very cute. The cons were the bathroom seemed a little dated and dirty. And as the RV park is right on the highway there can be a good bit of traffic noise. Overall we really enjoyed our stay here and plan to stay here again if we are in the area. We camped at The Blanco Settlement in a Fifth Wheel. Blanco, TX - Blanco Settlement. We spent two nights in this park. 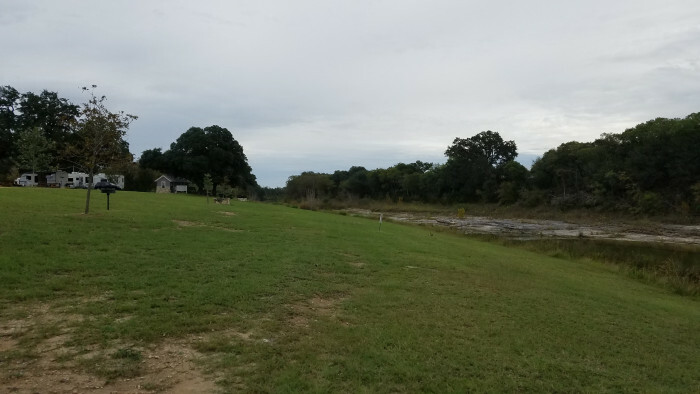 It's a beautiful, small RV park (20 pull through sites) with cute little cabins (9 of them) to rent on the Blanco River. Family owned and operated on 10 acres on the river. One mile from Blanco on Ranch Road 165. This park was washed away in last Memorial Day's flood but the owners have invested a lot of time and money to rebuild and it is just beautiful. The RV sites face highway 165 so there is some highway noise. They have a very nice gift shop as well. We would recommend this park and would stay here again. We camped at The Blanco Settlement in a Motorhome. Pretty park on the river. Very friendly owners and staff. Level sites, very clean. Not much shade. Will definitely go back. 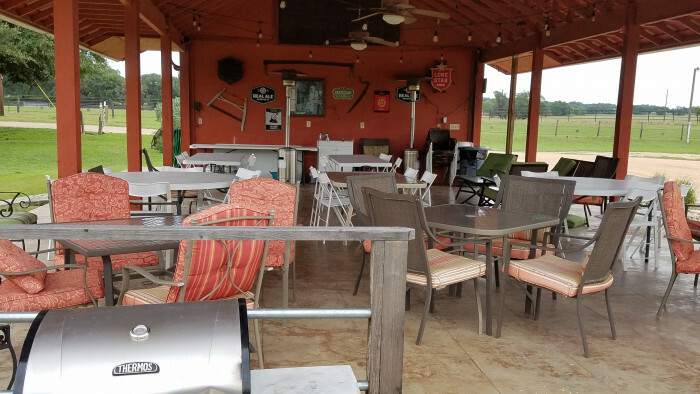 This is a great place for friends with RVs and those who need cabins. We camped at The Blanco Settlement in a Motorhome. We stayed three nights with some other RVer's. A nice park that also rents cabins. Appears to have a few full timers. Would have rated this park higher except for two issues. First, it sits right on a state road so there is some traffic noise. There is not a lot of traffic so the noise is not bad but thought it should be mentioned. The main issue we all had was with the park host, who I believe is also the owner. She is very curt and abrasive. We arrived on a Sunday afternoon with reservations but at a time the office is closed. First thing Monday morning, I walked to the office and paid for four nights. The lady that took my payment was very nice. I was in the motor home of one of our friends the next morning when the park host/owner pulled up in a golf cart. She did not get out of the cart but instead signaled me through the windshield of the coach with her index finger to come outside. She immediately told me I needed to get up to the office to pay. I explained to her that my site was the next one over and I had paid the previous day. She then told me to tell the owner of the coach I was in to immediately get down to the office and pay. The person that owned the coach had made the original reservations for all the sites, had stayed at this RV park previously, and had given the office his credit card number when he made the reservations. He simply did not feel there was a rush to go to the office. He did, however, go to the office a few minutes later and was treated just as rudely as I was. Perhaps a bad day for this person but we will not return to the park. We camped at The Blanco Settlement in a Travel Trailer. Rate is the daily rate without discounts, which they do offer for Good Sam. They also have weekly rates. Park is high priced for what it offers, it is bare bones; sites are FHU but fairly close. It is located in Blanco, which is very central to all Hill Country activities. Office staff was pleasant, they have a nice little gift and craft store. It does border a small river, fishing is probably OK. Off the main highway, this park would be quieter than the state park up the road. We did not actually stay here, but drove through and talked to staff about a possible stay. We later decided to stay outside the Hill Country "triangle" but felt this park deserved to be considered if you want to stay in the area. We camped at The Blanco Settlement in a Motorhome. Are you affiliated with The Blanco Settlement ?